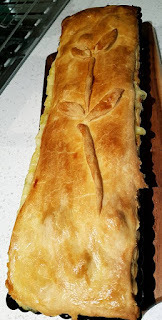 I don't often post savoury recipes here but as this lovely pie with its sour cream pastry qualifies as a baked item and as it is so delicious, I thought it was well past time that I shared the recipe. I originally got the recipe from Taste.com.au and I have made it so many times. Every time I make this pie, I am blown away by how full of flavour it is for so few ingredients. The pastry is so quick and simple to make with CC and it is lovely to work with too. Please excuse the pic - I forgot to properly seal the pastry - it did taste great though!! 1. Place plain flour and butter in the bowl with the kneading blade. Pulse until mixture resembles fine bread crumbs. 2. Add sour cream and egg to the bowl. 3. Select Pastry P1 for 1min 30sec and process until dough comes together. 4. Remove dough from the bowl and knead the dough lightly for around 30 seconds. 5. Weigh the dough and then divide into two parts 1/3 and 2/3. 6. Wrap the dough in cling wrap and place in the fridge for half an hour whilst you prepare the filling. 7. After chilling, roll out the larger piece of dough and fit it into the tin. 8. Roll out remaining dough to fit over the top of the pie. 1. Preheat oven to 200 degrees. Place a flat baking tray on the bottom shelf of the oven. Grease a 11cm x 34cm fluted rectangular tart tin. 2. Place diced chicken and olive oil in the bowl with the stirring blade. Select Slow Cook P1 for 15 min. When cooked removed from the bowl and set aside. 3. Place the butter and the leeks in the bowl with the stirring blade. Select Slow Cook P1 for 10min. (If the leeks need more cooking, continue in 3min increments until done). 4. Add flour to the bowl and select Slow Cook P1 for 5 minutes. 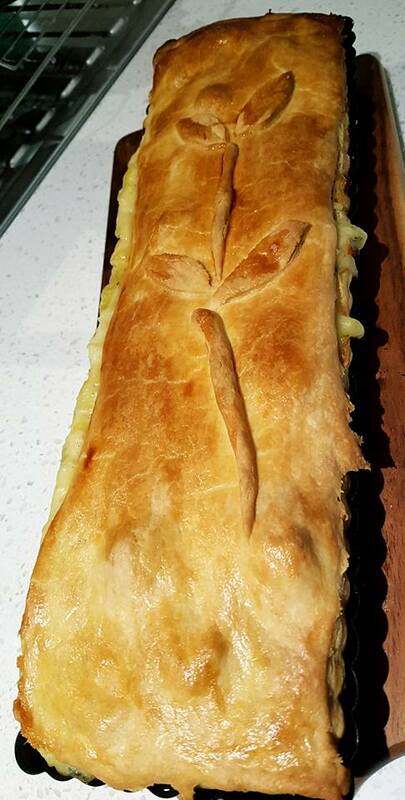 ( The flour may ball up with the leek but don't worry it will be fine!). After 3 minutes, slowly pour in the stock with the motor running. 5. When the program stops, add chicken and rosemary to the bowl. Select Slow Cook P1 for 4min. 6. After 3 min pause the program add the sour cream and season with salt and white pepper. Restart program. 7. Place the filling into the pastry lined tin. Place the top dough on and add decorative pastry pieces if desired. Glaze with egg and milk wash.
8. Back on the preheated tray in the middle of the oven for 40-45 minutes until pie is golden. 1. If you wish, you can swap chicken breast for the meat of a whole bbq chicken. Simply skip step 2. 2. You can change the rectangle tin for a fluted round tin of either 23 or 25cm.